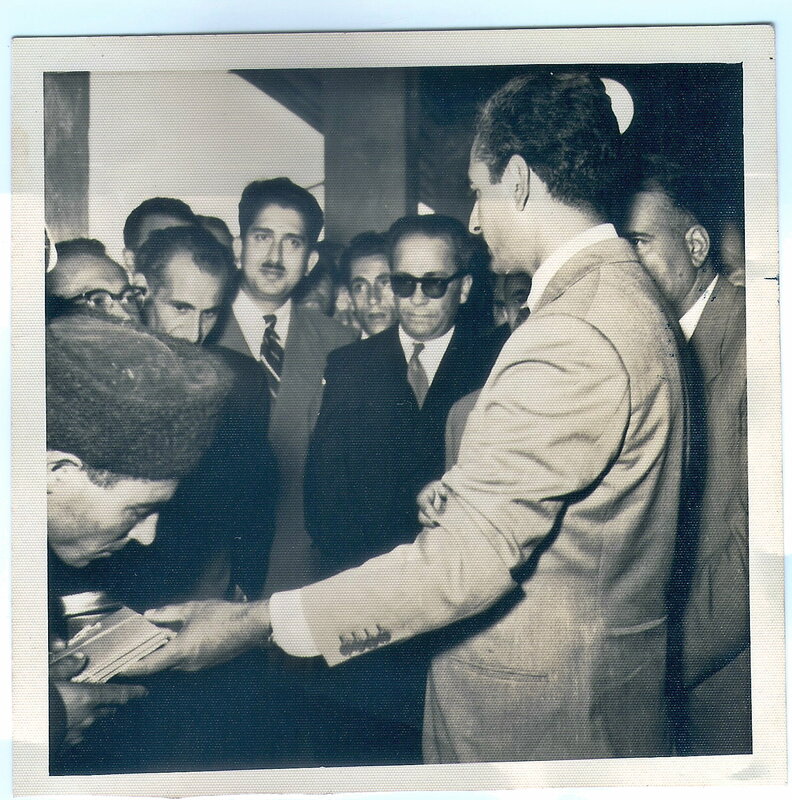 On the reverse of this photo is stated the date, 8 July 1955, and “the King enquiring about Indian development projects after the ceremony”. 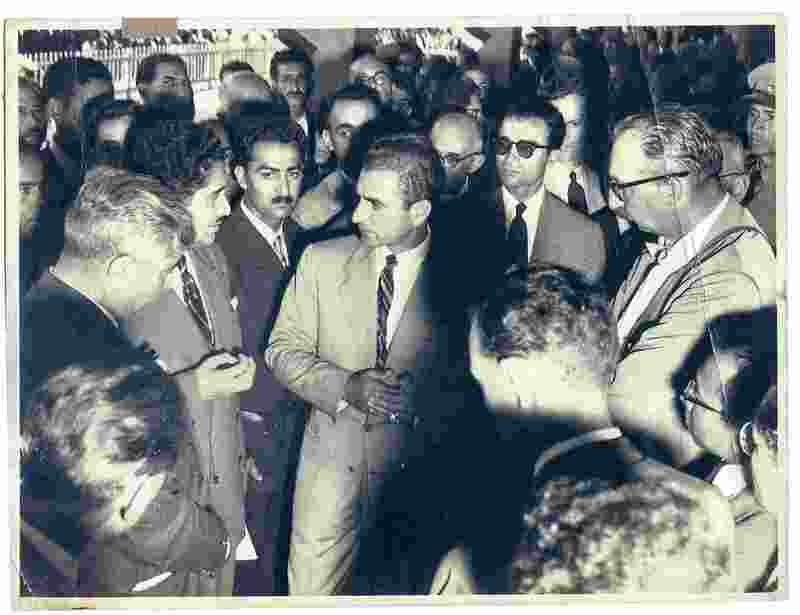 The person he is talking to is my father, then India’s Trade Commissioner in Tehran. 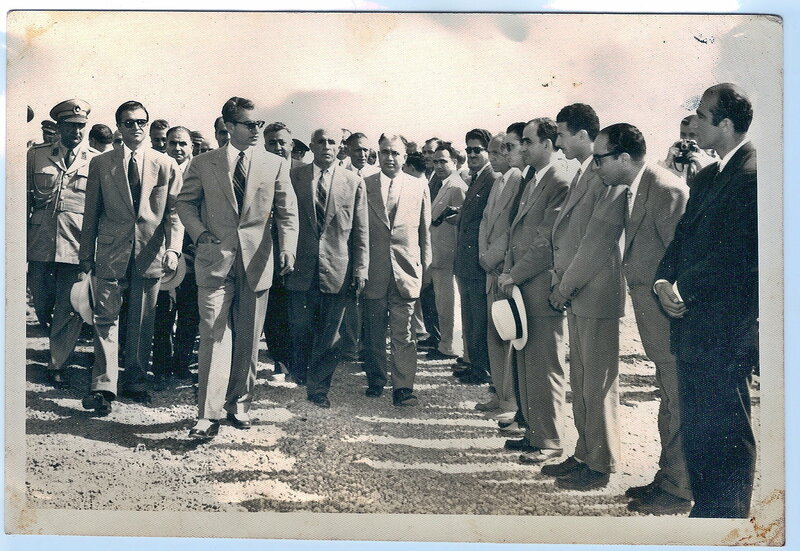 The two photos below show Mohammad Reza Shah Pahlevi striding by a line of guests (my father is seventh from the right in the line-up) and then meeting them. 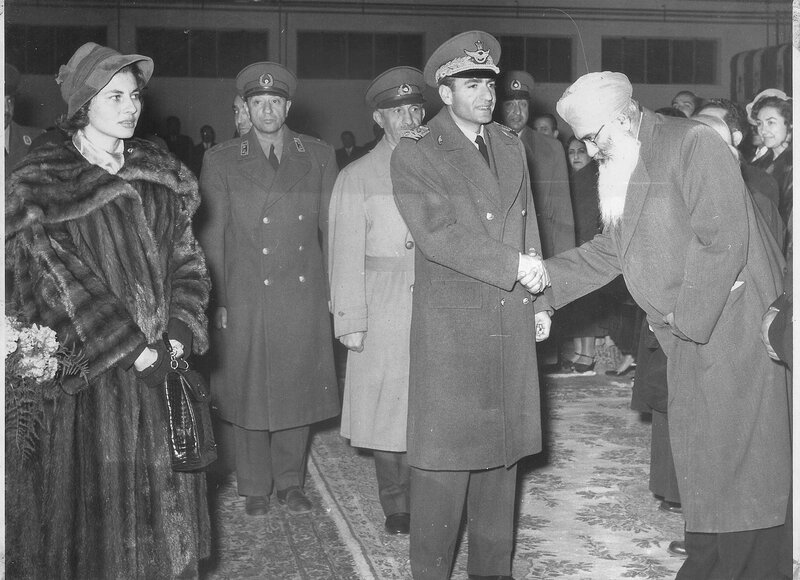 The next photo is of Reza Shah and his Queen Soraiya Esfandiary being greeted by a senior Sikh member of the Indian community. 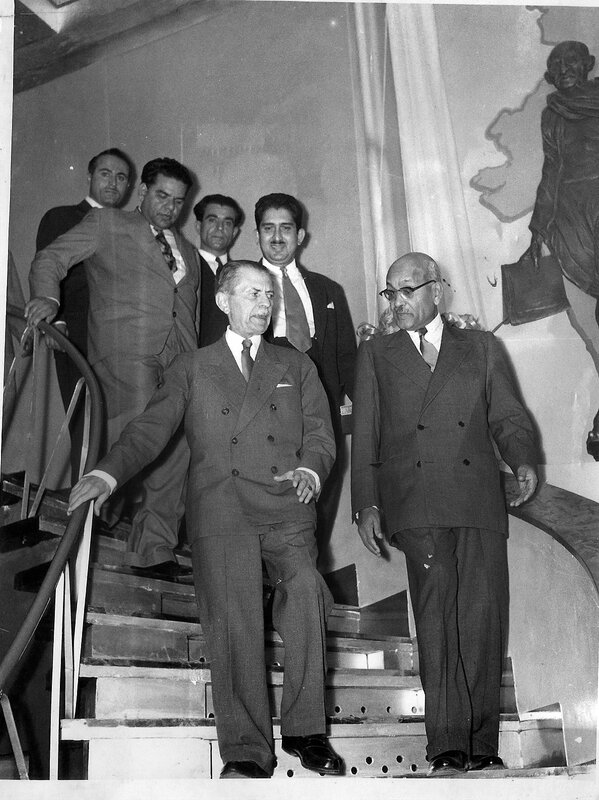 India’s Ambassador to Iran, Dr Tara Chand, author of History of the Freedom Movement in India, accompanies Prime Minister Hossain Ala, probably at the Indian Embassy in Tehran (there is a map of India and the figure of Mahatma Gandhi on the right). 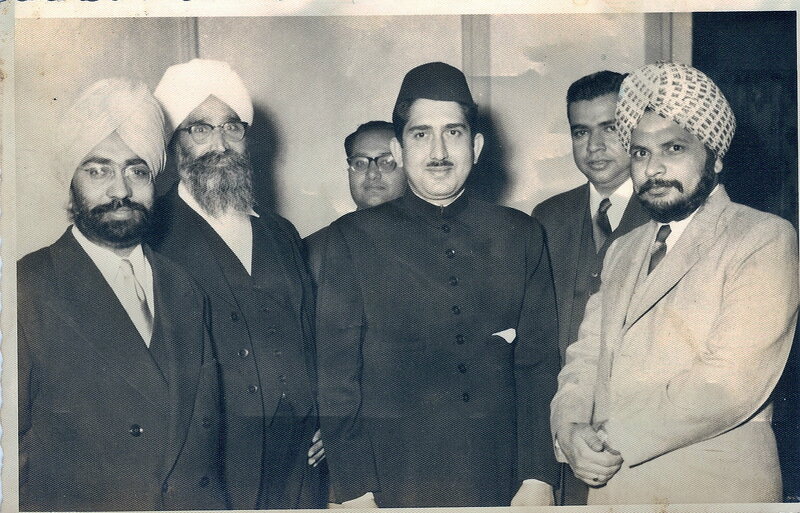 My father with members of the Indian community in Tehran. Iran, America, Iraq: Bush’s post-Saddam Saddamism — one flip-flop too many? All cultures generally, and Eastern cultures invariably, require utmost politeness towards an invited guest.The behaviour of the President of New York’s ColumbiaUniversity on 24 September was thus inexplicable when he gratuitously insulted his guest Mahmoud Ahmadinejad, President of Iran, even before allowing him to deliver the speech he had been invited to give at the university.Iran’s President has become the new hate-figure of choice in the popular American media ever since 2005 when he was mistranslated as having said he wished Israel “wiped off the map”.He has chosen to contribute to his own predicament by seeming to associate with and encourage those known as “Holocaust-deniers” – people who stretch from those who deny any systematic mass-murder took place of Jews by Nazi Europe to those who want evidence for the number of six million such victims that has passed into school textbooks. Modern Iran’s foreign policy should not have come to depend on the precise history of the atrocities against Jews by Christendom over the centuries. But that is what President Ahmadinejad has now, rather ineptly, made it depend on, jeopardising the lives of tens of thousands of his fellow-citizens from destruction caused by a massive and unlawful American, British, Israeli and possibly French attack. He has been quite needlessly provocative enough to allow himself to be painted by the American popular media, unscrupulous and unthinking as that can be, as some kind of Hitler-figure who plans some day to use nuclear bombs on Israel. Iran has been plaintively pleading in official circles that it wishes to use nuclear-power generated electricity at home while exporting its petroleum, that it has a right to do so as a member in good standing of the Non-Proliferation Treaty, and that it has neither wish nor capacity to develop nuclear bombs. But no matter the merits of its position with the IAEA, Iran has succeeded in isolating itself and seems to have almost no official allies on the world’s stage (though China, Russia, Royal Dutch Shell etc all have large investments there!). The US has detailed contingency plans to attack Iran though no American official or military officer has admitted or stated that any such intention exists. The outlines are an open secret. There would be sudden massive bombing of Iran’s military and general infrastructure, including its assumed nuclear installations. US Marines would make seaborne assaults on Iranian islands to prevent Iran from mining or closing the Straits of Hormuz or from attacking American bases or interests in the Gulf. US Army forces based in Iraq would launch massive long-range artillery and rocket attacks preventing Iranian ground forces attempting to manoeuvre or approach them. There may be an amphibious Anglo-American attack from the Caspian Sea towards Tehran. “Special Forces” by way of spies, saboteurs and agents provocateur would have already been placed within Iran to help targeting and other war-aims. One aim would be to permanently cripple Iran’s nuclear industry.A second aim would be “regime change” though without any attempt at a large-scale ground occupation of Iran which is recognised as impossible to achieve.The more extreme members of the Bush Administration led by Vice President Cheney aim to see Iran becoming a “failed state”, reversing whatever has taken place by way of nation-building, leaving an emasculated Iran, like an emasculated Iraq, that poses no threat to Israel for the next century and more. The traditional Christian ethics of a just war are planned to be practically ignored by the United States, and there would not be any formal declaration of war. America’s people either have barely heard of Iran as a place on the map and will mostly continue with their usual lives, or have no idea of the intricacies of the US-Iran relationship in the last 80 years, or have no wish to support their Government machinery’s intent to go to war but have no control over its behaviour. Three factors have held back an American attack though forces apparently can be made ready within days if not hours of a Presidential order. One has been top military officers, including Admiral Fallon, the head of US Central Command, who have said that Iran’s attempted retaliation on the ground could jeopardize 160,000 US troops now in more than a dozen bases spread across Iraq (besides Israel being threatened by Iran’s Hezbollah ally in Lebanon). A second factor has been the American Jewish community, who have apparently warned that a large bloody counterproductive war against Iran may have negative repercussions on their standing in American society. A third factor has been America’s foreign ministry which knows enough international law, politics and history to realise such aggression would be wholly unlawful, widely condemned by the world, and return the international system to the pre-1914 days of an imperialist free-for-all or destroy it altogether. The UN system would permanently end, and all methods and precedents of international cooperation, law and diplomacy would have been rendered irrelevant and deserving only to be flushed away and forgotten. The UN today seems to be led by an incompetent unknown who will produce even less of a squeak in protest than did his predecessor. Imperialism and Colonialism would return formally except in an age of advanced technology in which some nations have a right and ability to use nuclear weapons in pursuing dominance. The Geneva Conventions and even a medieval right like habeas corpus have already seen breaches; the Vienna Convention and other similar treaties and norms would all be effectively over.The international retrogression may be not merely back to 1914 or 1907 but to the tumult and savagery of Napoleon’s wars which ended with the Congress of Vienna in 1815. War-planning aside, what is most interesting is that in recent months the USA has apparently gone back to developing, as an alternative, something like Saddam Hussein’s own strategy for containing Iranian influence! Iraq’s Anbar province sits on vast oil reserves which are not going to be pumped as that would lower the price of oil from its current high near $83 a barrel. It is a Sunni-majority area which has now made its Shias refugees, just as Shia-dominated areas of Baghdad have seen forced evictions of Sunnis. The Sunni tribal chiefs of Anbar are now having their loyalty purchased by the Americans just as Saddam had once done, especially by playing an anti-Iran card as Iran is a common enemy. At the same time, the Bush Administration is hard-pressed to try to persuade Iraq’s Shia majority to resist what might seem the inevitability of Iranian hegemony — which can only be done by reminding them of their Arab anti-Persian roots again just as Saddam had tried to do. Anglo-American policy once was to build up the Arabs against the Turks, then the Pehlavis against the Arabs, then Saddam against the Ayatollahs who had toppled the Pehlavis. Saddam himself was then toppled and killed and now post-Saddam Iraq is being built up against an Islamic Iran that may be struggling in its own way to enter the modern world. Perhaps the 2003 invasion of Iraq has been one flip-flop too many for the USA and UK to cope with over the last century.